Italian language schools and study abroad programmes by The Language Class. Our company would be delighted to organise a stay in Milan. We can take care of organise your language school your accommodation and any cultural activity for you and your family. Our language courses can be from a week and you can stay as long as you want. The lessons are based on the communicative task based method and are intensive courses. This mean that you will practice the language from week one and study 3/4 hours a day. Choose Milan to study Italian. Fashion, opera, art, gastronomy and night-life What else can anyone ask to a city when planning to learn a new language? 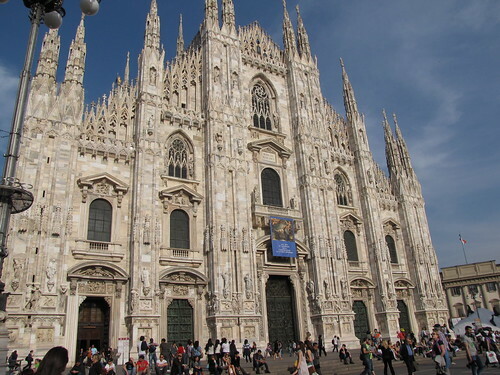 The new Italy is brought out in Milan, though it is not the capital of Italy, it is the main economic and cultural pole. Discover why Milan is one of the most fascinating cities of Italy and the ideal place to learn Italian. History and culinary traditions in Milan. Its location controlling the plain of Po and the access to the Alps made of Milan an important center during the Middle Ages. It has suffered all over the centuries wars to conquer the city by popes, Habsburgs, Napoleon and a long list of famous rulers. Nowadays it is a modern and cosmopolite city rebuilt after the II World War bombardments. Its gastronomy is more based on rice than on pasta, which is something quite exceptional in Italy. Ossobuco (stewed veal shank) is very frequently used for several typical dishes. But the most famous ones are risotto alla milanese (rice cooked with beef marrow and saffron) and cotoletta alla milanese (veal breaded cutlet). Do not miss gorgonzola cheese. The difficulty of choosing a museum in Milan is evident due to the large amount of incredible places to visit. The most famous ones are probably those in the historical center such as the Museum of the Cathedral (Duomo), the Sforzesco Castle and the Royal Palace. But there are some other interesting museums to visit like Hangar Bicocca, a contemporary art museum inside a huge hangar. Aperitivo or happy hour is an important event in Milan. Bars offer drinks at a fixed price combined with snacks and appetizers. Try La Ringhiera, Slice or Mas, which are some of the most chic restaurants and cocktails bars you will find for your aperitivo. The variety of clubs in Milan is one of the most attractive features of the city. Start at Corso Como, follow at Navigli quarter and finish at Colonne di San Lorenzo. All the choices available from electronic music to salsa. If you really want to enjoy Milan, you must absolutely learn the basic fashion vocabulary. Il quadrilatero della moda is the Fashion Quadrangle. FieraMilano is one of the biggest furniture and design fairs in Europe. And other important events are Fuori Salone and Salone del Mobile. When choosing Milan to learn Italian, take into account that it is a city full of entertainment, design, fashion and history. Being so multicultural can help you to meet people from all over the world. Many students decide to study every year in Milan as it locates some of the top Italian universities. You can be the next one. 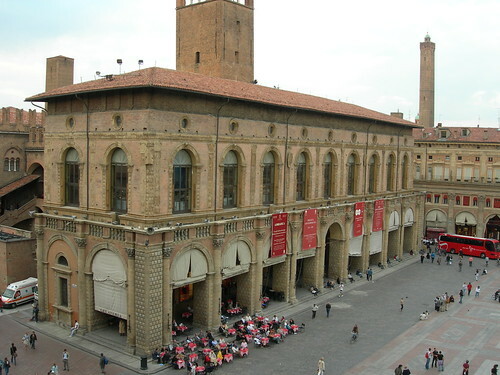 One of the finest cities in Northern Italy is Bologna, renowned by is university, the oldest one in Europe. That also means a broad student population surrounded by exquisite food, old museums, red bricks architecture and an exciting nightlife. Climb up to the towers and check why Bologna is known as “la Rossa” (the red one) by looking at the roofs in the historical center. Practice Italian with the open minded local willing to meet people from abroad. The Language class, study abroad language programmes. The Language Class would be delighted to organise your language learning stay in Bologna. We can organise your language lessons, and your accommodation And if you family and friends are coming to visit we can also organise cultural activities for your group, such as Parmesan cheese production visits. The old town is amazingly well preserved. Traces of all the people conquering and ruling the area are present: from Romans to Austrians passing by Goths or Lombards. But above all, the proud of Bologna is its university, founded in 1088. Nowadays a great part of the activity of the town is linked to student’s life. Gastronomy in Emilia Romagna, the region of which it is the capital, is one of the most important in Italy. It is not in vain that another nickname for the town is la grassa (the fat one). Bolognese sauce, prepared with meat and tomato is a must with many pasta dishes. Prosciutto (ham) and mortadella are the basis for many appetizers to be tasted with Lambrusco or Pignoletto wines. Do not miss the Medieval Museum with incredible manuscripts, sculptures and Islamic art. In search of paintings the option is the National Picture Gallery, exposing Emilian and Venetian works by Tiziano and Giotto among other important artists. Most probably the University Museums are the most important ones related to science: Carducci Room, la Specola (the Astronomical Observatory) or the Museum of Natural History are some of them. As it corresponds to a city where culinary tradition is so significant, there are lots of restaurants. Enoteca Italiana, twice chosen as the very best in Italy, Diana with its excellent tortellini in brodo and Garganelli are among the very best in Bologna. In Via del Pratello are located popular bars and restaurants for young people or students. And once the visitor is full of energy again, nightlife awaits. Via Zamboni, near the university, is full of pubs and clubs. Al Piccolo in Piazza Verdi is a famous place with a DJ. If you prefer something more alternative, search in Via Pratello. Mutanye might be the right place. Italian cooking lessons are held in the many Bologna’s cooking school in Via Augusto Righi. It is taught how to prepare fresh egg pasta. You just need to mix 100g of wheat flour and one egg per person. Knead with your hands until the aspect is smooth and homogeneous. Use the pasta machine to give it the shape you wish. Cook it in boiling water and dress it with Bolognese sauce. Bologna is the ideal place to learn Italian as it is a medium size city without the disadvantages of places like Milano or Roma. History, art and culture join together with gastronomy, industry and science. Student from everywhere meet at the university and give place to an exciting nightlife. What else can be asked to learn a new language?